Sold by Barons Best Goods and Fulfilled by Amazon. Gift-wrap available. Sold by Barons Best Goods and ships from Amazon Fulfillment. Sold by Monster Pets and ships from Amazon Fulfillment. Starmark are one of the world leaders in pet education. They keep pets happy in their homes by improving relationships with their owners. All products are developed by experts and performance tested by thousands of dogs at the Starmark Academy Animal Behaviour Centre. For more information visit: starmarkacademy website. 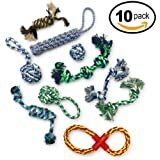 The Starmark range includes a variety of different toys to help alleviate anxiety and boredom behaviours and provide hours of mental stimulation. 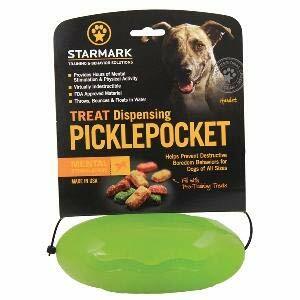 Please note that Starmark treat dispensing toys do not include treats. 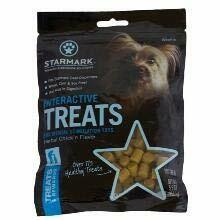 You can buy Starmark interactive treats or use your own preferred treats or kibble. 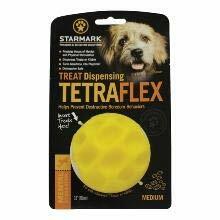 Which Starmark product is suitable for my dog? 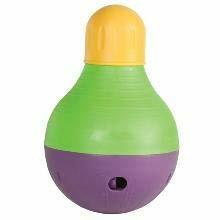 This toy is available in medium and large, and rolls, bounces and even floats in water! 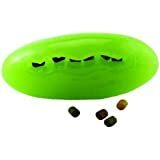 This product can hold a variety of treats or kibble, is virtually indestructible and is dishwasher safe. 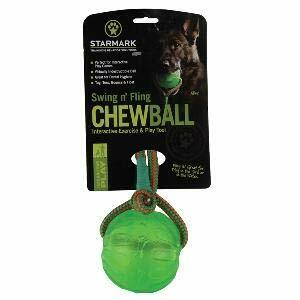 This Swing & Fling version of the treat dispensing chewball is fun to throw, easy to retrieve and safer than a tennis ball. 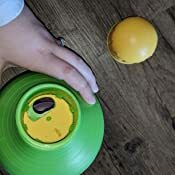 This uniquely shaped treat dispensing toy bounces and floats in water. 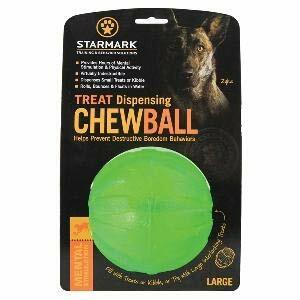 Great for powerful chewers and provides a good interactive chewing challenge. This toy, available in three sizes, provides hours of mental stimulation and turns mealtimes into playtime! 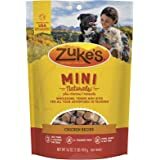 Can hold a variety of treats and kibble. 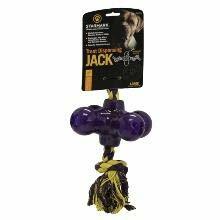 This toy, available in three sizes, has multiple chambers for dispensing treats and kibble. Multi textured to encourage play and helps to reduce anxiety and boredom behaviors. 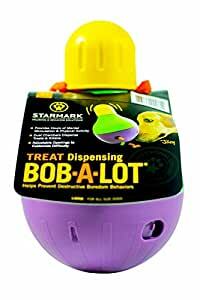 Available in a large and small size the Bob-a-lot wobbles and bobbles dropping treats as it goes. It has adjustable openings to customize difficulty, providing a good interactive challenge. Wheat, corn and soy free treats which fit into all Starmark interactive toys. 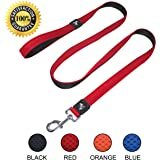 Designed to help dogs stay active, while they enjoy their treats. Available in a herbal chicken flavor. Aids digestion. Interactive toy holds up to three cups of food and has adjustable openings. 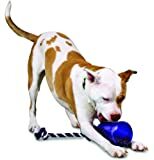 I read tons of reviews of this toy on a few different sites, and the main negative was that this toy is not to be checked chewed, which contradicts the tough durable toy advertisements. So I made sure to listen and watch to tell when the toy was empty to avoid chewing. After my Lab playing for 15 minutes the yellow toy was demolished with a hole, making the toy unusable. The company was called and they would not sell me a yellow replacement top. I was told that I'd need to purchase a whole new toy. Had they sold or given a new yellow top I'd time my dog and check top after 5 minutes, and so forth and possibly buy several more. But with the poor customer service I would never buy another one or recommend buying this to anyone else. 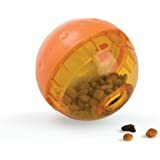 The orange semi clear ball dispensing food toy from another company has lasted a year and is cheaper and more durable as advertised for large dogs. Excellent feeding toy. It performs as advertised. Many reviewers don't seem to read the full description of this item. 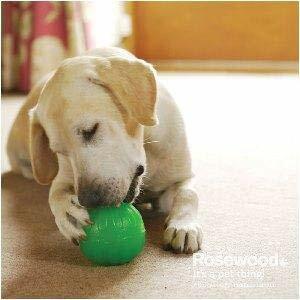 It is a hard plastic feeding toy for dogs and puppies that eat too fast. This is not a rubber toy to leave around for the dog to play with all the time. No where does it say this toy is durable against chewing. I have a 9 month old Boxer that knocks this thing all around the house during feeding time. She has never tried to chew it. I got it for her at 4 months old. She understands now that it is her meal dispenser for her 2 meals a day. After a couple weeks she could tell when there is food in it and when it is empty by hitting it a little bit. It sounds like a maraca when it has food in it. She has never tried to chew the actual toy because I took the time to train her how to use it. 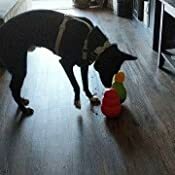 It sounds like some reviewers are putting food or treats in the toy and leaving them unattended for a long duration, long enough to chew the cap off. 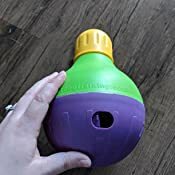 Keep in mind that at first the dogs will think this toy has an unlimited supply of food inside it, so when it stops dispensing, they may be motivated to chew on it to get more to come out, this is where training comes in and not leaving the dog unattended. So don't expect this to be a meal feeder and an all day toy that you can leave out, that is not what is is designed for. 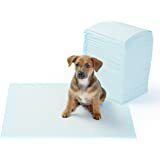 Another consideration to remember is don't use this item upstairs where the dog can push the toy down the stairs, it would have a good chance of breaking. In conclusion, I purchased this toy as a meal dispenser to slow the eating rate of my Boxer and it works perfectly. My Boxer gets excited when it comes out and it keeps her attention as she eats. It slows her eating pace down to about 20 minutes for 2 cups of Iams Puppy Food. I've never left it out as a toy for her to play with so now she doesn't bother it unless it has food in it. One negative comment I have is trying to fill this dispenser with 2 cups of food is a bit tedious. Its takes about 3 minutes to get all the food in the little hole at the top where you have to shake it so it falls down in to the main lower chamber that has the 3 cup capacity. I would suggest they double the purpose of the cap and make it some sort of funnel. It would be very east given that its already close to being shaped like a small funnel. Just add a sliding door to the top of the cap like the other 2 doors on the toy. Hope this review helps, ignore the bad reviews, just use this toy as intended and you will have no problems. 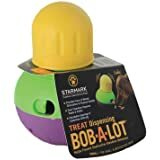 I purchased this Starmark Bob-A-Lot and the Kong Wobbler at the same time. 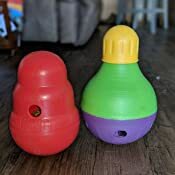 My dog does prefer the KONG Wobbler (See picture for comparison), because it is easier to knock treats out. The Starmark is nice, because you can customize it. You unscrew the yellow topper and put treats (I use his regular kibble and he enjoys it all the same) in the top. There is a little switch inside that you can pull to the desired size, so treats don't come out too easily. There is another switch like this on the side of the toy where the treats come out. 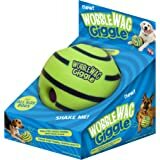 I feel like this wobbling toy is more sturdy than the KONG version too. 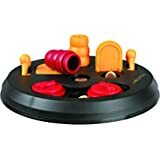 I feel like the KONG version's threading is going to wear down faster than this one as this one seems to be more durable. (My dog likes to pick it up and drop it from the couch). 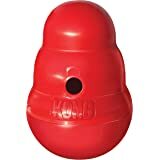 All in all, my dog prefers the KONG, but in the long run I think this one will stand the test of time. He has been playing with these for several months now and has not broken either one yet! Our very active pit-mix/Dr. Distructo tore his ACL last week and I bought a bunch of toys to “help stimulate his mind” since his physical activity is so limited (sad-face emoji). I gave this to him 30 mins ago as I prepped dinner. While he got the kibble out, I wouldn’t say he followed the rules... This is junk! If your dog is a chewer, I would not buy this. 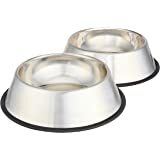 My dog was having some issues with being left for more than a couple hours and our trainer suggested that we look into some interactive feeding solutions. I spent quite a bit of money on various ones, and this is by far her favorite. When I got it I really didn't think she would like it. But she took right to it. I like that I can change the size of the holes to make it easier or harder. I don't know if I am to keep the ribbon on it, but she loves that. When we are are home she will go out to her area in the kitchen and drag it out to the family room and either keep feeding or drag it to us and paw it to let us know it is empty. Our dog is just 6 months old and only 5 pounds, so the amount of food it holds is perfect. I was setting down another interactive feeder when the kibble spilled. She ignored all the food on the floor and only wanted the pieces that she got out of her Bob-A-Lot. This has made such a difference. I had a hard time getting her to eat enough food, but not anymore. We have had it now for a few weeks, and she still loves it. 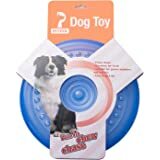 Petper Dog Flying Disc Toy, Dog Frisbees Durable Pet Toy 9"